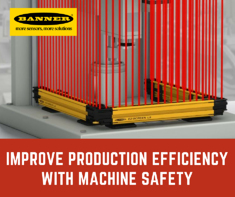 Banner Engineering is a pioneer in the world of machine safety, and has designed & developed products that can protect personnel & equipment from accident without limiting the level of productivity. In simple words, Safety Light Curtains are invisible curtains in between a transmitter and a receiver. As soon as an object passes through this curtain, an alarm is generated leading to a specific action as programmed by the user. Banner offers Type 4 safety light curtains that can be installed as guarding points for areas of sensitive nature. Similarly, Type 2 curtains are also available, offering a cost-effective solution for lower-risk applications. LS Series Type 4 Simple Safety Light Curtains - These light curtains are easy to use machine safeguarding & safety devices, that can withstand the environmental challenges usually found in manufacturing & packaging environments due to the IP65/IP67 rating. Featuring a range of 12m, the curtains are available in three detection capabilities, 14mm, 23mm & 40mm. The curtains use a dual scan technology, making the sensor highly immune to any ambient light, EMI or RFI. The system requires absolutely no PC software or DIP switches. Type 2 Safety Light Curtains - These are compact optical safeguarding solutions that work perfectly with low-risk applications, preventing risk of injuries such as bruises, tripping, knock-down, etc. The curtains offer a range of 15m, and a resolution of 30mm, detecting any narrow objects as soon as they make contact. These devices are required in hazardous areas where workers need to be able to stop devices during an emergency with the push of a button. 30mm Mount Emergency Stop Buttons - The easy-to-install stop button requires no assembly or individual wiring, and is a plug & play solution. Available in red & yellow colors, the button is rated for IP65 level environments, and can be coupled with multiple other brethren in series. Safety Cable Pull Switch with Emergency Stop Button - These also act as emergency stop buttons but instead of having a push mechanism, they rely on a cable that has to be pulled to illicit a halt reaction. The spans range from 6m – 100m, and both trip & latch switch models are available for installation. The housings are designed to withstand harsh-environments, having a minimum switch life of 1 million operations. Safety interlock switches are designed to respond as soon as a mechanical guard opens. These switches are built to withstand harsh conditions, including any attempts to override the switch and defeat the system. SI-Mag Series Magnetic Safety Interlock Switches - These compact & sealed safety interlock switches are an ideal replacement for their mechanical counterparts, resisting any dirt or water from accumulating. All models are available in normally open and normally closed actuator contact. The user has a choice for the actuating system and can choose from plunger, roller, spindle-mount or two-lever styles. These scanners provide a laser safety solution for mobile & stationary applications that can’t be covered by other safeguarding solutions. AG4 Series Safety Laser Scanners - The two-dimensional safety laser scanners effectively protect personnel and stationary or mobile systems within a specific area. The protective & warning fields can take almost any shape, and if necessary you can switch between 8 pre-configured field pairs. The response time is adjustable from 80ms to 640ms. The scanner is available in two variants, one with a range of 4 meter, and the other of 6.25 meters. Relays have long been known to act as an interface between a safety device and a machine that is being monitored & controlled. Safety relays offer similar functionalities. E-stop & guard monitoring safety relays - The module is capable of monitoring up to 10 external devices for failures & faults. Available in NEMA 1 and IEC IP20 ratings, the relay can withstand tough conditions. Monitoring can be carried out over a DeviceNet control network, while on-ground, the relays also possess Led indicators to show their status. Duo-touch SG series safety relays - These relays monitor a pair of STB self-checking touch buttons, and feature redundant microcontroller circuits to ensure reliability. The relay requires activation of both touch buttons within one-half second for operation. The output is provided in the form of two Normally Open 6 amps signals. There are several other types of safety relays available as well, designed for a specific parameter such as pressure sensitive safety mat relays, safety extension relays, safe speed monitoring relays, muting safety relays, and so on.